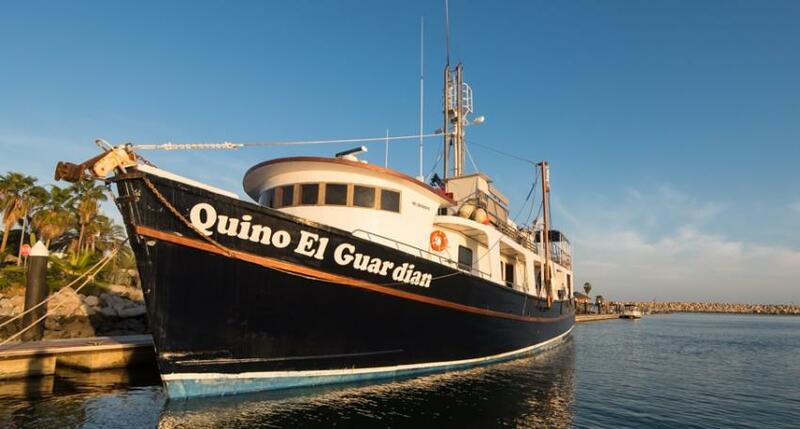 Quino El Guardian trips combine fun and research expeditions. Marine biologists and researchers will join trips. It’s a great opportunity to be a part of the ongoing research carried out while you are on board. Training experience of the diving crew will make diving extremely successful for novices experienced divers. Quino’s routes include visiting of amazing destinations such as Socorro, Sea of Cortez, Baja Peninsula. It’s true divers paradise where you can meet sharks, dolphins, dive with sea lions, and whales. The total capacity of Quino el Guardian is 16 persons. The boat has four quad cabins and one twin bed room. There are four shared bathrooms on board. Time in between dives passengers of Quino el Guardian can spend at the lounge area. It is spacious, has air conditioning. Divers can discuss their diving adventures or watch TV. Boat’s dive deck is big and comfy. It has all necessary items for convenient preparation and maintaining the gear. There are numerous of storage boxes and rinsing tanks. Safety is always important and crew of Quino el Guardian cares about it. Boat equipped with emergency rafts, life rafts in each cabin and firefighting equipment, oxygen and first aid kit. Quino el Guardian offers a Sea of Cortez itinerary. This area is truly amazing. During the safari, you will get a chance to meet such extraordinary creatures like whale sharks, sea lions, hammerheads and mantas. A diverse of marine life of Sea of Cortez is awesome. Divers often can meet horn sharks and even whales. Divers can explore pinnacles and caves of Sea of Cortez. Reefs feature with colorful corals sponges and gorgonian fans. Diving season in the Sea of Cortez last all year. Divers usually prefer time in between July and October. For whale watching better to choose September and the end of November. I spent awesome holidays with Quino. Diving was really good: first diving, I saw dolphins, mantas, hammerhead sharks. and last day, I saw a couple of humpback whales under the water. Amazing trip ever! And food was so nice. It was the most delicious food I had ever eaten in liveaboard. All crew are very kind. I miss Quino. I hope to go again next year. I have been on many live-aboards all over the world, and I say this boat had the best crew EVER! In every facet the crew carried out their roles superbly. From Juan the Cruise Director and Dive Master, Jorge, hands down the best cook/chef I have ever experienced, to all the individual crew members......WOW!!! The diving itself was interesting and I will be back.